-It is a 10km run. -The start is located in Elephant & Castle, Lambeth. -There will be a labyrinth/maze concept to the run. -Runners need to bring a fully charged smartphone (to help ‘navigate the Labyrinth’). -And that this event will be “like no other”. Registration was limited, and hopeful runners could sign-up for the event, with only a handful being successful. Apparently, the selection process was random. Although I am not aware of the figures, it would appear that there were between 200-250 runners there on the night. 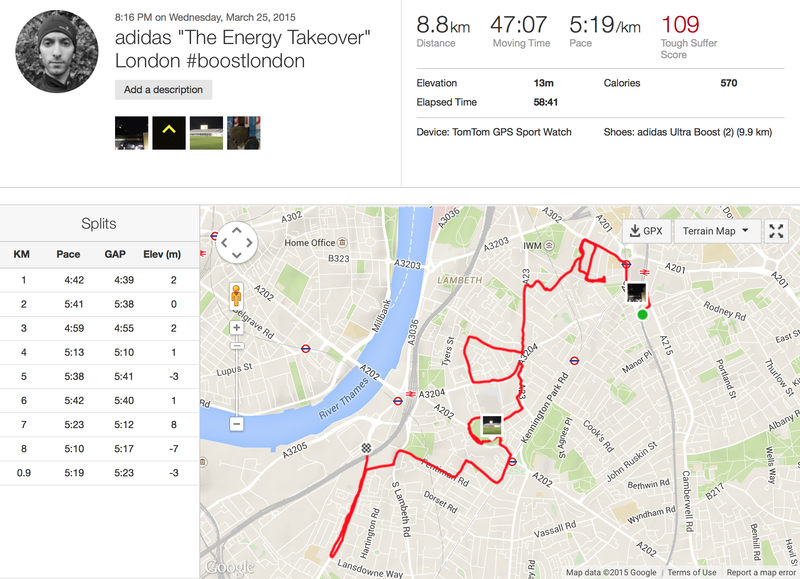 Before the event, runners were sent a race pack consisting of an adidas branded “energy takeover” T-shirt, a smartphone armband (which is suitable for an iPhone 5 sized mobile) and an information leaflet. On arrival, runners were registered and received one of 3 coloured wristbands (I was pink), which would determine a specific route to follow to the finish in Vauxhall. Once we had received a wristband, runners would then queue up to hand over their current running shoes, and be handed a pair of (brand new) adidas Ultra Boosts! This was quite a nice surprise, and as expected, runners were quite pleased with this start! These are adidas’s flagship running shoes, and having had many positive things to say about them in my review, I was ecstatic! The run itself was scheduled to begin at 8pm, but was delayed until 8:15. However, a live commentator was present to help keep the crowd motivated and spirits up before the run. The starting place was a warehouse/garage-like structure (very urban-like), with a big time counter at the front, along with a shutter. At 8:15pm, as promised, the shutter began to raise itself, and runners were unleashed onto the dark streets of Lambeth. There was a little bit of confusion at first as to which direction to head in, but we soon saw coloured arrows, corresponding to our wristbands, and followed them. Along the route, there were marshals scattered in various locations/checkpoints, who gave us directions in which to head. 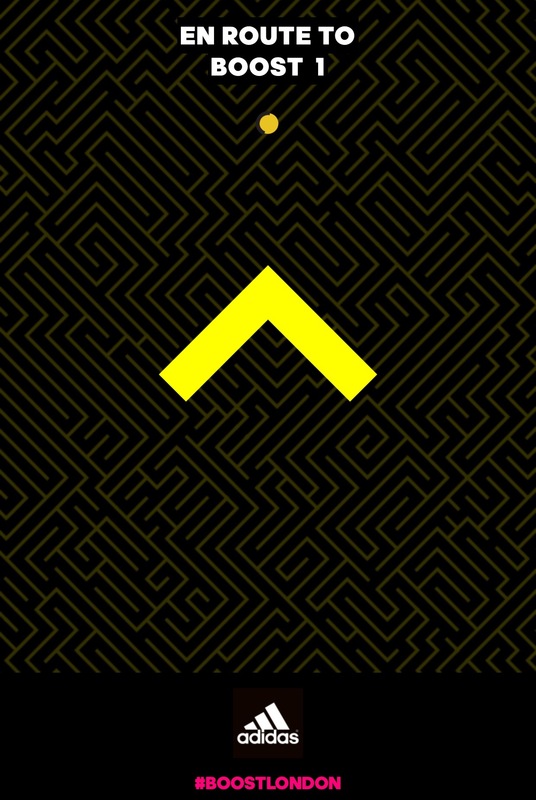 There was also a compass app adidas provided us with (via a special link) which was supposed to help us navigate. Unfortunately, this did not work, and other runners also reported the same. I was with a group of runners and we got a little lost, heading toward some dead-ends, meaning a lot of going back on ourselves and looping around in circles, trying to determine where to go. Was this the aim of this run? It seemed to be a lot like a maze now! Speaking to a few marshals, they themselves were a little unsure about where the race actually ended and where to go. I was beginning to think that this was some kind of psychology experiment rather than a run! I eventually, after some 9 kilometres and 56 minutes, managed to make it to the finish (which I actually ran past!). This time is someway off my 10km PB (which at time of writing is 38:18), but I think that may be missing the point of this run. This was not a run for a PB, and I highly suspect anyone treated it as such. 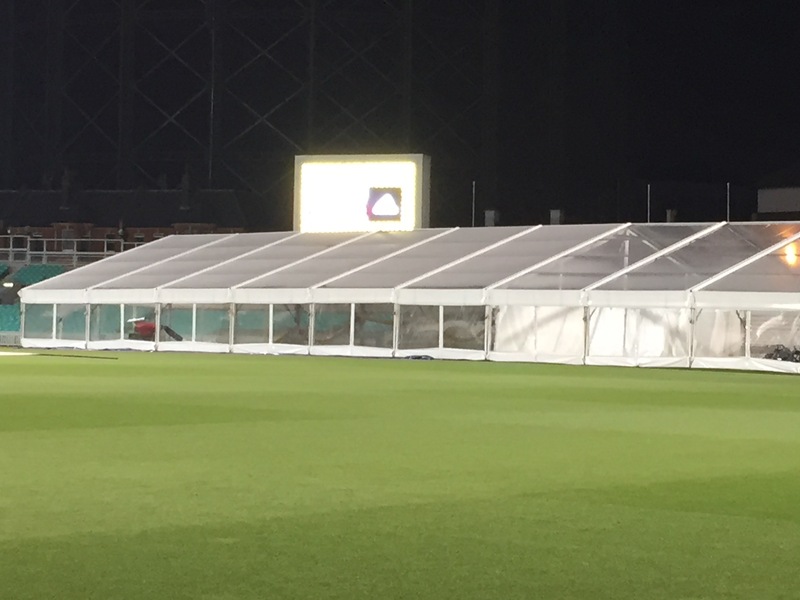 A nice part of the event was running through the Oval cricket ground. I am not much of a cricket fan and had never been here before, so this was a nice addition to the run. Another interesting part of the run was being cheered on as I ran through a pub (cannot remember the name), as well as being handed water there with pictures being taken. After getting lost a few more times, I finally crossed the finish line, and was handed a lovely chunky adidas medal, and was not at all expecting this! Having been to many races and now the proud owner a nice medal collection, I can honestly say that this is one of the nicer medals I have received, and quite frankly felt it was well deserved after all the navigating to get to the finish! 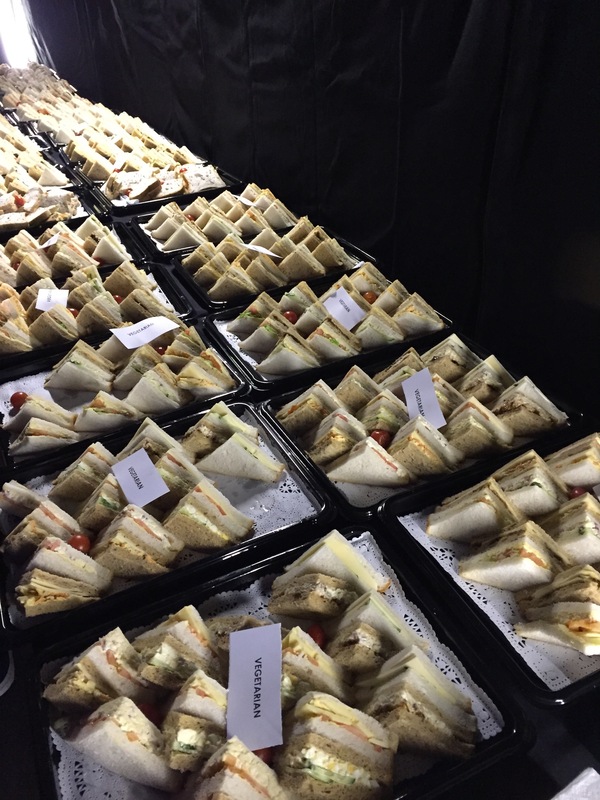 There was also a small after-party, with sandwiches, Carlsberg beer, Lucozade Sport and water. After having a chat with a few other runners and collecting my shoes, I made my way to Vauxhall station to catch the train home. Conclusively, this was a unique and interesting running event. Definitely a fun run to help unwind at the end of the day, as opposed to serious and competitive running. Of course, the highlight of the evening for most was receiving a free pair of running shoes and a nice after party. 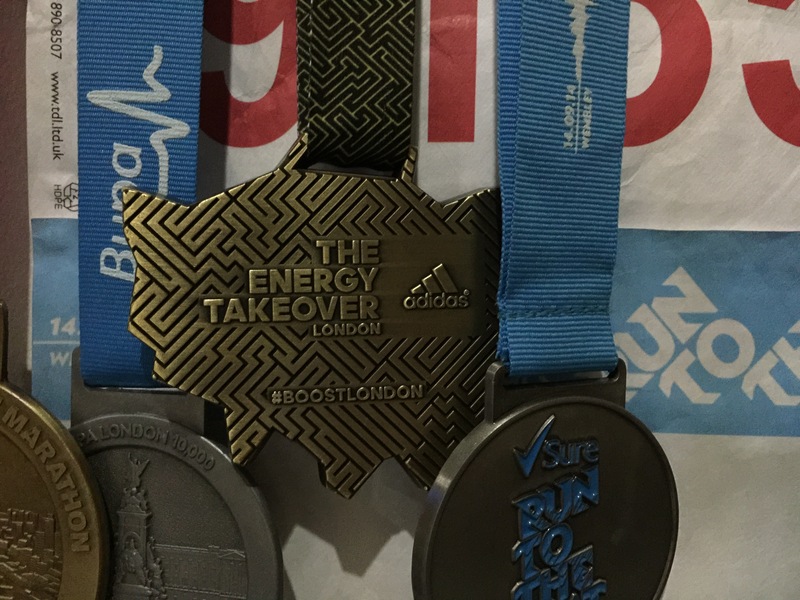 I love the adidas brand, as well as running, so was happy to be a part of the first “energy takeover” in London, and would definitely be keen to participate in any future events. PS: I did not have the opportunity to take many pictures whilst running, but have been told that adidas will be uploading pictures online shortly, so will upload any pictures as they come my way. I ran yesterday too and loved it! For me and my friend the compass didn’t work either and we also saw it more as a fun run rather than a race where we could smash our PBs. I hope they host more events like this! Glad you enjoyed it, too! Hopefully they organise more events like this; would be great to #‎boost other places in London! !